The Cook-a-Palooza Experience: Roast Potato Salad - Would You Give It an "11"? Roast Potato Salad - Would You Give It an "11"? Mmmm, potato salad! Everyone loves it and just about everyone makes it differently! 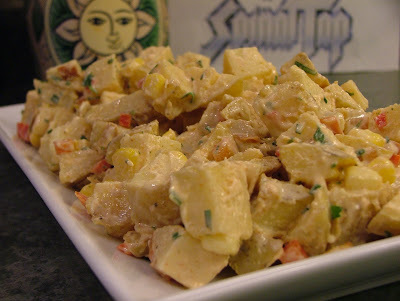 But why bother making potato salad when you can make roast potato salad! Get this. You love potato salad right? And who doesn’t like crisp roasted potatoes. 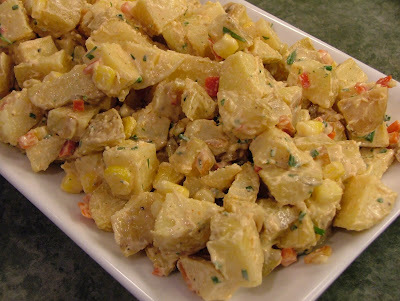 So why not combine the two to make the ultimate potato salad! It makes this salad one notch better than regular potato salad. It’s like in the movie Spinal Tap where Nigel Tufnel, lead guitarist, shares how the amplifier for his electric guitar goes to "11" where most only go as high as 10. 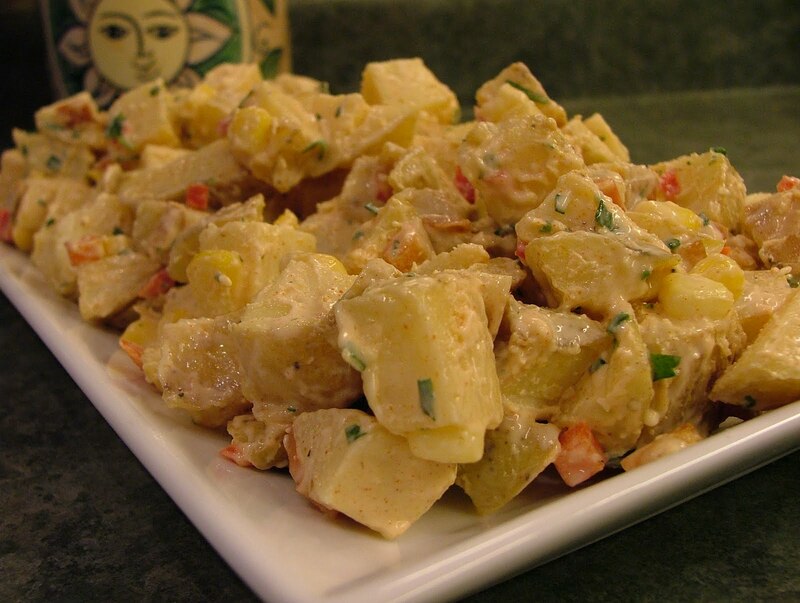 A few other steps were required to make this potato salad an eleven out of ten. One was to not peel the potatoes. The peel is where the flavor is so leave it on. It was also important to ditch the celery. I know it’s usually added for crunch but I’ve never heard anyone get excited about celery. How about red bell peppers? Now there’s a vegetable with crunch, vibrant color and exciting flavor. Chives and potatoes are like best friends so I added them and I like parsley in my potato salad so it was also included. Finally I thought corn would be a nice touch so I tossed in some kernels and finished it off with a bright creamy dressing. Would the boys from Spinal Tap consider this potato salad an "11"? I’m bettin’ they would! But they're fictional rock stars and they'll eat anything. The true test will be if you think this potato salad is worthy of such a ranking! Place cut potatoes in a colander and rinse thoroughly under cold water to rinse off surface sugars (this will help the potatoes crisp when you roast them). Place potatoes in a large saucepan. Add just enough cold water to cover potatoes and season with salt. Bring to a boil over high heat. Reduce heat to medium-low and let simmer for 3 minutes. Drain potatoes and lay them out on paper towels to cool. Place potatoes on a large baking sheet. Toss with oil and salt. Roast in a 425º F oven for 20 to 30 minutes until potatoes are cooked through, crisp and golden brown. Turn once halfway through the cooking process. Remove from oven and season with salt. Meanwhile to make dressing, in a small bowl, whisk together mayonnaise, sour cream, lemon juice, Parmesan cheese, mustard, paprika and black pepper. In a large bowl gently toss together roasted potatoes, corn, red peppers, chives, parsley and dressing. Chill before serving!